I have an exam in the morning and I'm really stuck on the practise assessment 2 Q4. Please could you help me work this out? To take advantage of the 3.5% settlement discount they are spreading the purchases out over 4 months (so 480+560+520+540 / 4 = £525,000 per month). In the first month (Apr) they are paying 60% of the April £525k less the 3.5% discount (so £315,000 - 3.5% = £303,975). 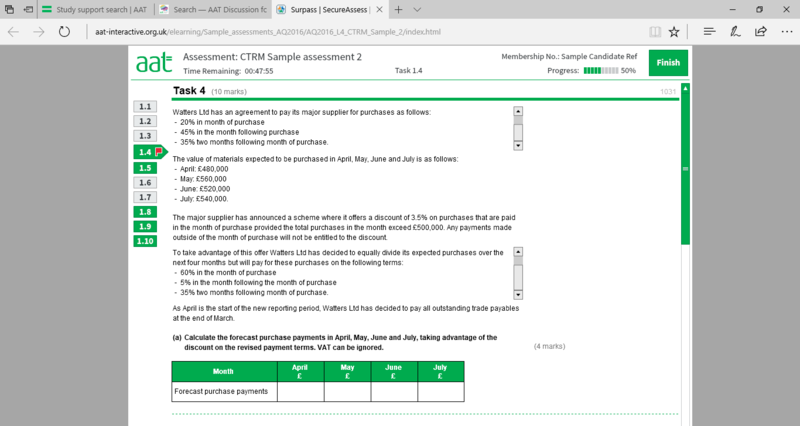 In the fourth month (July) they are paying 60% of the July purchases less the 3.5% discount (£303,975) plus 5% of the June purchases (£525,000 x 5%) and 35% of the June purchases (£525,000 x 35%) so £303,975 + £26,250 + £183,750 = £513,975. It's a little difficult to describe without drawing a table up but I hope that helps in some way! PS I hope your exam went well, I had mine last week.... it was pretty brutal! @scamp83 thank you for clearing this up for me. I have just finished the mock and I couldn't work out where I went wrong. I was working it out on a month by month basis! Where does the £26250 come from?